Contributions by: Carolina Agredo, Anna Artaker, Elke Auer, Zanny Begg, Lina Dokuzovic, Veronika Eberhart, Eva Egermann, Eva Cruells, Marina Grzinic, Simina Guga, h.arta, Ana Hoffner, Reni Hofmueller, Maja- Lena Johansson, Ivan Jurica, Vida Knezevic, Katharina Koch, Lisbeth Kovacic, Ladyfest Romania collective, Lovekills, Roxana Marin, Ivana Marjanovic, Julia Mitterbauer, Emil Moise, Katharina Morawek, Crina Morteanu, Lilo Nein, Gerhild Perl, Alina Posirca, Rosa Reitsamer, Joanne Richardson, Karin Schneider, Sabine Solkner, Esther Straganz, Andi Tennis, Lisa Torell, Julia Wieger, Veronika Wohrer, Regina Wuzella, Vina Yun. The book Are you talking to me? Discussions on knowledge production, gender politics and feminist strategies is a result of the collaboration between the Post Conceptual Art Practices (PCAP) department at The Academy of Fine Arts in Vienna/ Prof. Marina Grzinic and h.arta group at the invitation of Bucharest Biennale 3. This book was conceptualized and developed following the idea of asking questions. Not only is this an outcome of previous practices of its editors, but it is also the attempt to ask: What does it mean to pose a question? What does it mean to answer? What about the feminist movement during communism? As Veronika Wöhrer points out in her contribution (referring to Jiøina Šmejkalová), the assumption that there were no feminist movements, theories or activism during state communist times, turns out to be a myth. Western scholars or activists often locate a certain lack of theory within post-communist countries, which includes assumptions about the »need« of post-communist activists and scholars, and ideas about what an interesting or useful theory should be like. The image that is inscribed here, is that the »rich west« should share its feminist theory with the »poor East«. In fact, the situation was very different: the contexts for »Eastern« feminist ideas, activities and publications were different, also the terminologies deviated from international »mainstream« feminist or gender debates and therefore often remained unacknowledged. State feminism from Romanian communist times (at the beginning of the 1950’s) led to a genuine emancipation of women. Later, during the regime of Ceausescu, »emancipation« and »feminism« became empty phrases, covering the gloomy reality of thousands of dead women as a result of the regime’s pronatalist politics – deaths occurring before the background of official hymns glorifying a generic »Woman«. Nevertheless, some women did find their ways to revolt, or at least they would have wanted to – the illegal abortions performed by them being in itself some way of revolting. Even though »state feminism« was functional for state communism in the sense of turning women into »emancipated« workers, activists and mothers (and, by being part of the collective, they were productive for the »cause«) many questions regarding women´s rights were dismissed. Today, the collective is disused – in any case among the youth and among opponents of nostalgia. Masses of individual warriors, everyone is working hard on her personal strategy. In the context of Romania, this is especially true since the integration process into the European Union has started. There are some Women’s Studies courses at the universities, but what about feminist traditions? Today, feminism or the question of women’s rights are very often reflected as something that had been imposed from the outside, as something in violation of the traditional roles of women, roles that would necessarily be associated with some sort of national mark. At the same time, the emancipated socialist woman is referred to as an »import«. In Romanian mainstream discourses – from tabloid articles to opinions stated by some of the elite intellectuals – the main critique of feminism is that it is a notion »imported from the West«. The concepts of both Gender Mainstreaming and feminism are often understood under the same label of »alien« discourses. So, how to address questions of social inequality or sexual politics? What are the differences and similarities between the perception of »state feminisms« from communist times and the »new«, »European« Gender Mainstreaming? What is the role of the actual woman advocating feminism in relation to these two forms of »equality from above«? And what is the relation between feminism and Gender Mainstreaming? The principle of Gender Mainstreaming aims at the (re-)organization, improvement and development of policy processes in such a way that gender equality is actively taken into consideration at the level of policy-making. It focuses on different political actors in stimulating them to take the principle of gender equality into serious consideration. Although some European Union member states have started to implement Gender Mainstreaming, the strategy of implementation is still vague and open for a variety of different interpretations. In a way, the same abstract »woman« that was a reference point for state feminism is the one that is protected today in the several anti-discrimination laws that Romania »received« from »Europe« during the European Union integration process: the Law for Preventing and Combating all Forms of Discrimination (2002), the Law on Equality of Opportunity between Women and Men (2002), the Law for Preventing and Combating Violence in the Family (2003). But the question that arises reading these laws (which are translated into Romanian in such an artificial language that you silently need to re-translate them into English while reading, in order to understand which concepts they refer to ) is what is the efficiency of this imported notion that exists at a purely legislative level and that is not connected to a political agenda or public pressure? Who do these laws about »gender equality« really protect with their raw generalizations? For example, they accentuate the public sphere and are explicitly labour-related, but neglect the private realm and connected problems of domestic violence. What is the role of these laws, besides provoking the feeling that there is nothing left to fight for any more and furthermore giving the post-feminist glossy magazines new reasons to explain »the power of femininity«? The transformation processes that post-communist countries are facing since their integration processes into the European Union are to be seen in a very critical way, though they are termed as »democratization« (politically) and »liberation« (culturally). This book wants to ask further: which kinds of transitions are taking place? What is the meaning of democratisation and liberation, if resulting in a liberal democracy that administrates the rights of their citizens, but that keeps the sovereignty to define what these rights are? An important manoeuvre which is characteristic for processes of transition is the re-writing of ourstories/theirstories. This leads to the question: in which ways is the so-called post-communist »silence« about feminism connected to the history of the roles of women in communist times and to the roles of women in present-day Romanian society? Keeping in mind Romanian women from the recent past and from the present, women dying of self-provoked abortions, women supporting most of the exhausting economical burden of the times of »transition«, women raising their children with minimal public support, women economically forced to choose between career and motherhood, women experiencing the effects of »glass ceilings« in their jobs, women facing daily discriminations; the texts in this book reflect the space between their/our lives and the perception of women within state policies. 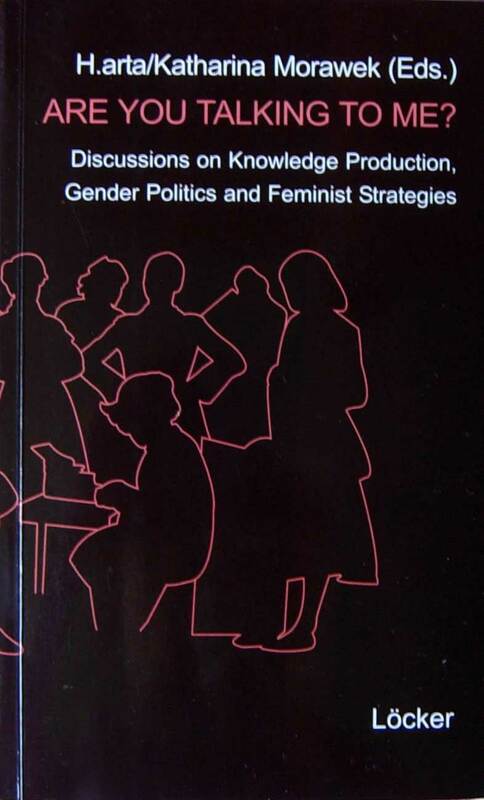 And keeping in mind the different positions about the institutionalisation of »women’s politics«, the book discusses the diversity of those positions through the diversity of the topics tackled, topics that interrelate education and knowledge production, feminist strategies, anti-authoritarian stances and politics of representation. It is important for this book to propose and call for alternative herstories of women and to ask questions about generations – not generation in a biologistic sense but in the sense of conflict lines and her/historical transfer. The questions that this book poses are aimed towards the translational action that many of the texts already take into account. A translation that picks up questions, acts upon suggestions and re-designs the question after the answer. Through interviews with the participants and contributors, the goal of the book is to translate this collaborative approach into a visible form. This publication is an attempt to contribute to the archive of her/histories. It is an attempt to ask questions.